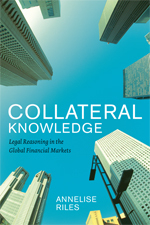 Today Cornell Law School celebrates the publication of Professor Annelise Riles‘ new book Collateral Knowledge: Legal Reasoning in the Global Financial Markets. Prof. Riles is the Jack G. Clarke ’52 Professor of Far Eastern Legal Studies and Director of the Clarke Program in East Asian Law and Culture. The book examines how the financial markets are governed not only by legislatures that pass laws (from the top down), but also by people and entities that participate in the system (from the bottom up), ranging from academics to people who fill out financial forms. Prof. Riles engages her topic by means of ethnographic study in Japan. The book is available in the library and from amazon.com. I also recommend Professor Riles’ interesting blog, also entitled Collateral Knowledge, where she continues the discussion. Submissions for the third annual ABA in Law diorama contest are due by April 5. You can check out this year’s entries so far; entry instructions are available here. You could win up to $150 in Peeps, the perfect snack to power you through finals! 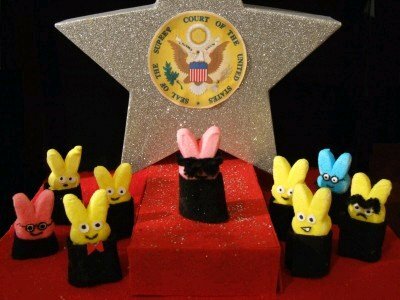 OK, maybe Peeps aren’t the greatest brain food, but it would still be cool to win. Judge rejects Google Books settlement; Next step Congress? Adequacy of class notice. Judge Chin rejected this objection. Adequacy of class representation. Judge Chin found there to be an issue regarding the existence of competing interests between class members. Scope of relief under Rule 23. The judge found that the scope of the settlement goes beyond permissible bounds in several respects. First, the settlement reshapes copyright law related to orphan works and affects international copyright law, which are matters more properly determined by Congress. Second, the settlement goes far beyond the boundaries of the complaint, which was limited to the scanning and display of “snippets” by giving Google the ability to digitize and sell copies of millions of books, including books still protected by copyright. Third, the interests of some class members have not been adequately represented, such as academic authors who may prefer free access to their copyrighted books and the copyright holders to orphan works, who have a conflict of interest with Google. 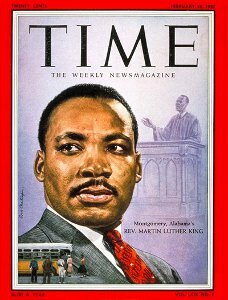 Fourth, the agreement violates copyright law by requiring copyright holders to take affirmative action to prevent the scanning of their books. Fifth, the settlement grants Google a monopoly over orphan books and increased Google’s position in the search market. Sixth, some objectors have concerns that consumers will lose privacy in their reading habits to Google, but Judge Chin rejected this concern due to Google’s safeguards. Seventh and lastly, despite the removal of certain foreign works from the ASA, foreign copyright holders continue to object that the settlement will affect their works and violate the international copyright law. So what’s next? In closing, Judge Chin informed the parties that he may approve the settlement if it were changed to an “opt-in” agreement from an “opt-out” agreement. This option is extremely unattractive to Google because it significantly decreases Google’s ability to exploit the books it has digitized so far. So what is next? A status conference is scheduled for April 25. Google has not yet publicly responded to the court’s decision. Settlement does not seem very likely. An “opt-in” settlement agreement accomplishes very little for Google because Google can, and already has, continue to make private agreements with publishers and authors. Many of us hope that Google will approach Congress to pass copyright reform, such as this legislation that stalled out in Congress in 2008. While Congress is the appropriate forum for addressing the issue–and not a far-reaching agreement between corporations and private parties–Congress is notorious for leaving the crafting of copyright legislation to large, wealthy, corporate copyright holders. The voices of libraries, the public, and people who make use of public domain materials, are typically ignored. So although I have been hoping for the settlement to be rejected so that Congress can tackle the problem, there are some serious barriers to its passing. Google will propose legislation very similar to the ASA, except the Registry will be government run and the ability to exploit orphan works will be opened up to other entities. Companies like Amazon and Microsoft will not like this because Google has a head start on commercializing orphan works. Congress will ignore provisions meant to assist libraries in digitizing their collections or helping patrons gain access to orphan and out-of-print works. Is there any way to make arguments in support of a robust public domain palatable to Congress? The guide is published by Globalex, an online collection of research tools for foreign and international law hosted by the Hauser Global Law School Program at NYU Law. Globalex publishes research guides for many countries, and these are a great, free place to help familiarize yourself with that country’s legal system and legal publications, including Web sites. 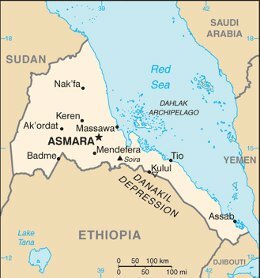 The foreign law guides are generally written by lawyers who have studied and practiced in these countries. Globalex also publishes research guides about international law and comparative law. Congrats to our Library Survey prize winners Joseph Pohlkamp and Lilian Balasanian! Congratulations to the winners of our prize drawings from the Cornell Law Library’s student survey! 2L Joseph Pohlkamp is the winner of the reserved study carrel for Fall semester 2011, and 3L Lilian Balasanian won the $25 Cornell Store gift card. Thank you to everyone who took the time to participate in the survey. Your feedback helps us make the library even better. We will share the results of the survey with you soon. The Pew Research Center’s Global Attitudes Project recently released a report showing that computer and cell phone usage have increased significantly throughout the world, especially in certain countries such as Russia and Argentina. The report also looks at the use of social media and email, and analyzes technology usage by age group and gender. The full report is available here. The legal-disclaimer-is-funny theme. In 2008 Pillsbury Winthrop made sure the card’s recipients were fully apprised of the dangers of snowballs. This year the Wall Street Journal Law Blog declared Manatt, Phelps & Phillips’s card to be the best of the 2010 season. Manatt’s card takes a meta approach, humorizing the card design process. The disclaimer in Manatt’s card is very similar to those used in Akin Gump’s 2009 card, which won Above the Law’s 2009 holiday card contest. The do-gooders theme. Howard Rice donated the savings from skipping the paper card in 2009 to charity, inviting the recipients of its electronic card to select the charity. Dickstein Shapiro sponsors an art contest every year at a public high school in Washington D.C. and features the winning artwork on its holiday card. In 2007, Stearns Weaver thanked clients for making this really large gift possible. The solidarity-with-clients theme. Grodsky & Olecki represented some members of the Writers’ Guide during the strike in 2007 and reflected that representation in their card. I would like to see this theme used more often. Is it just me, or do almost all of these cards feature music written by the same person? Happy holidays, and please–wear your Snuggie properly.